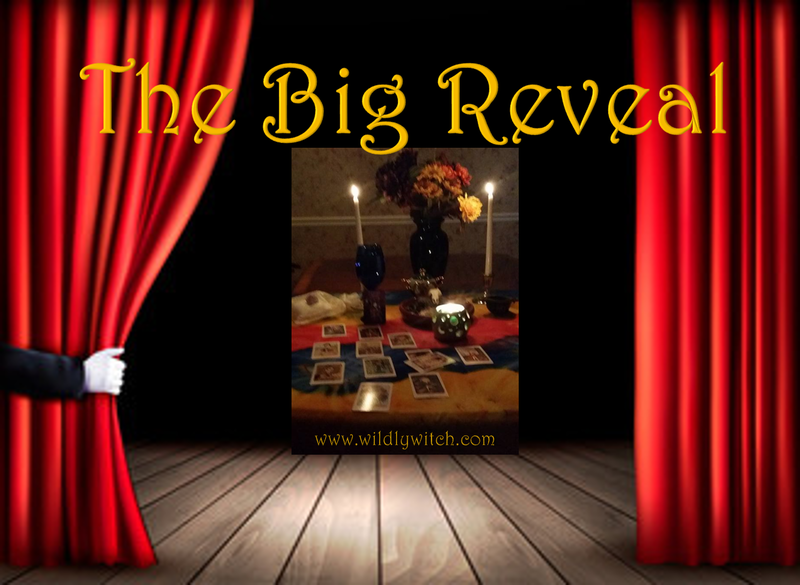 Here is our Big Reveal for Tarot Tuesday. If you haven't done so, go to the Facebook Page, ground yourself, and choose your card. For those who have, let's get to it! Are you getting along with your co-workers as you put together the big project? Has someone turned to you to ensure that a job will get done? Is there a task at hand that you know will be completed on time and as perfect as humanly possible? Have you realized lately that you are the best person for a certain job? When an organized approach is needed, have you been getting the call? Is your partner allowing you room to be yourself because you bring so much to the relationship? 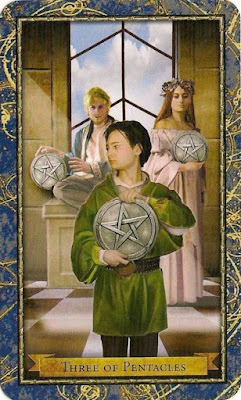 The Three of Pentacles is a card that would indicate all of these and more issues associated with competency and hitting your stride. 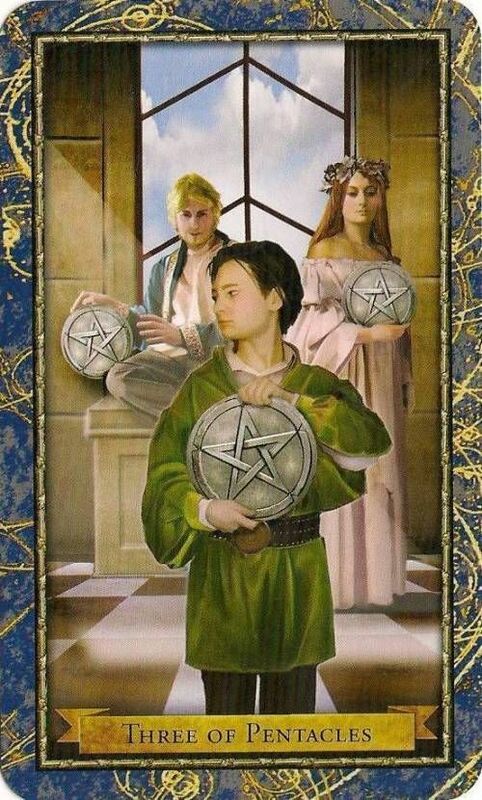 The 3 of Pentacles tells you that the people around you appreciate you and your efforts, and notice the quality of what you do, even if you don't get a paycheck. The Three tells you to keep doing what you're doing as you are on the right track (although there is always room for improvement.) You don't need to scrap something and start again. Have you ever spoken truth to the powerful and did not even realize the challenge you had presented them? Are you learning the complex jargon of a new field and comprehending what a new you could look like when you master this language? Have you looked at the reasons you should stay or leave a relationship? Is an employment situation requiring you to be less than honest about what the company can or cannot do? 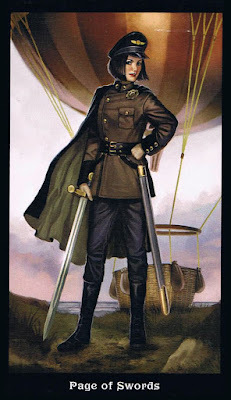 All of these circumstances bring about a Tarot reading that includes the Page of Swords laid out before you. In general, the Page of Swords represents delayed news, ideas, planning and inspiration. It can also signify being protective, guarded and vigilant. This page may be telling you to be patient, to think before you speak and not to get drawn in unnecessary arguments or conflicts. It can also represent fairness, speaking out and fighting injustice. The Page of Swords can indicate mental agility, learning or getting an education, being quick-witted, curious and inquisitive and using your head. This card can signify being chatty, communicative, truthful and direct. However, it can also signify being blunt or abrasive or engaging in petty gossip. Key words: Delayed new, mental agility, vigilance, think before you speak. Do you suffer from anxiety? 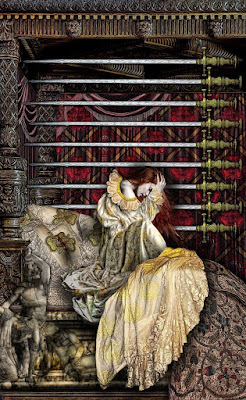 The 9 of Swords often indicates that in a querent. Oftentimes, this card reveals that we're thinking too much about what could happen, rather than what's really going on. It could also reveal that we've made some decisions, and the results are not what we desired. In short, you may be making mountains out of molehills. It represents stress, burdens, negative thinking and deep unhappiness. You will be feeling overwhelmed and unable to cope with or face situations, problems or just life in general and may have reached your breaking point. It is a Minor Arcana card of mental anguish, remorse, guilt, regret, joylessness and despair, and you may wish you could go back in time and re-write the past when it appears. It can also signify feeling isolated and being the subject of gossip and it can represent nightmares and insomnia. If you are feeling anxious, take a good look at whether or not any of that is under your own power or control (and thus, you could lessen it), or if other things or people in your life are contributing to this anxiety. If it is the latter, take a good look at that, and see whether or not something in the relationship can be changed to make it more workable for you. There's something about this time period that can cause people to feel like their life should be, in some way, "more" or "bigger" than it is. Try to take comfort and joy in the ordinary things. That's where the beauty is. Key words: fear, anxiety, stress, being overburdened, regret. 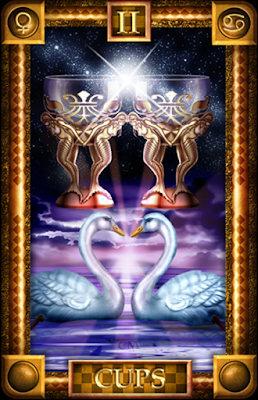 The 2 of Cups often refers to romantic partnership, but that is not its only connotation. It can speak of balance, friendship, joy, and sharing. In general this is a card that says that things are likely to be going well. You should be feeling more than usually loved, cared for, and content. In a career context, the Two of Cups can represent a strong and successful business partnership. If you are considering entering into a business partnership with someone, it is a good omen that indicates that you and your business partner will work well together, and will have similar goals and mutual respect for each other. If you are not in or entering into a partnership, the Two of Cups is still a good sign, representing harmony and balance in the workplace. You should find that things are going well and that your working relationships with colleagues should be going well. Financially, things should be balanced at the moment. You may not have an excessive amount of money but you will have enough to cover your bills and not worry. Key words: Partnership, unity, love, harmony. How did you do? If you are new, WELCOME! For those who have been doing this a while, are you seeing improvement? Come, join us on the Facebook page for discussion and support. We'd love to hear from you!